Info "Lions may be ferocious, but they can't stand up to the awesome power of a...chair." 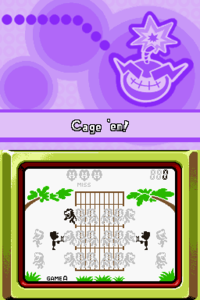 Game & Watch Lion is a microgame found in WarioWare: Touched! in the Retro Action stage. It is set in the Game & Watch game of the same name, Lion. The object is to move the two lion tamers on either side of the cage vertically to a spot where they are able to keep the lions from escaping. Only one lion moves at a time. Level 1: One lion tries to escape. Level 2: Two lions try to escape. Level 3: Two lions try to escape, but move vertically. "Lions may be ferocious, but they can't stand up to the awesome power of a...chair." This page was last edited on February 16, 2018, at 17:27.